SOAP RST-5 (RESIN SEPARATION TECHNOLOGY) - C-L Sp. z o. o. The system is considered harmless, safe and more environmentally friendly by many. It is a good alternative to such solvents as acetone or methylene chloride. 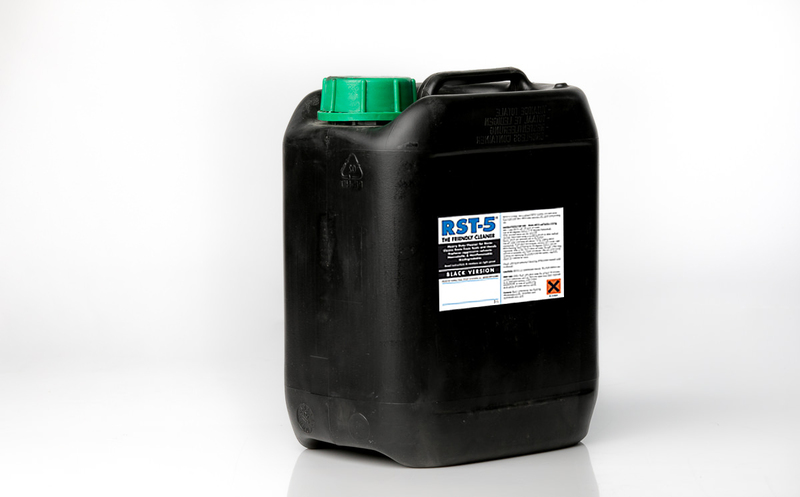 Unlike acetone, RST-5 does not solve resin but it causes resin dispersion (dissipation, fragmentation) and separation. Dispersed resin falls to the bottom of the container with the liquid, it deposits and may be quickly and easily removed, leaving clean bath for further use. From time to time more RST-5 agent should be added to maintain high washing efficiency. This washing method cannot be compared to hazardous, harmful and expensive solvents such as acetone. RST-5 may be used for washing off resins, paints, lubricants, oils and dyes from a wide range of tools, brushes as well as hands or clothes. RST-5 reacts to most polymers and is suitable for washing hands. Acetone and other solvents may pose a risk of cancer, they permeate into the skin, damaging internal organs and the nervous system. RST-5 may be used as degreasing agent for metal parts in plants or workshops. RST-5 washes best at the temperature of ca. 40 °C, higher temperature will improve washing efficiency. The same case with washing away – the brush is required. You may wash at room temperature but washing efficiency will be lower than in case of higher bath temperature. The best washing temperature may be selected experimentally.